Mike began playing competitive SCRABBLE® on January 30, 1980, which was the first or second week of existence of the new Lexington, MA SCRABBLE® Club. At that time, he was somewhat familiar with the OSPD, since he had been using it as a reference for playing the Parker Brothers game Boggle® since receiving that game as a Christmas gift in 1978. After honing his skills in Lexington for a few months, he was then confident to hit the big time at the formidable Boston SCRABBLE® Club. After a few weeks of proving himself against the lower division players, he qualified to play in the Boston Club's upper division. He played regularly in both clubs until May, 2007, when he switched to becoming a regular at the Exeter, NH SCRABBLE® Club. He also occasionally plays at the Tuesday night Worcester SCRABBLE® Club and the Wednesday night Manchester, NH SCRABBLE® Club. He also plays with an informal club at the Chelmsford, MA Senior Center and at a cafe and entertainment venue in Chelmsford. Over many years he played in other clubs which have since stopped, such as in Framingham and Sharon. In the eighties, Mike was one of the top Massachusetts players. There were some years when he was declared the top player in both the Boston and Lexington SCRABBLE® Clubs. Then came along Alan Frank, Jere Mead, Merrill Kaitz, and Adam Logan. Also, since the early eighties, other competition emerged, notably Richard Buck, Steve Root, and Paula Kaufmann. And there are others getting better all the time. Today, playing strength is in the Lexington Club, where Mike tends to only sometimes get ranked among the top ten players. From 1980 through 2018, Mike has played in about 230 tournaments. The place to see all the details is at http://www.cross-tables.com; at the top of the home screen there, click on Players and then enter Wolfberg. Mike's most valuable prize from playing competitive SCRABBLE® was the result of playing in a non-sanctioned fund-raising tournament on Cape Cod, probably in the Winter of 1983. For scoring the highest in that event which was played over a 3-week period, he came away with a microwave oven and several other valuable items. In other SCRABBLE® events, he is lucky if can gain back the entry fee for playing in a weekend tourney. Mike gained his short burst of national fame when he won the Nathan's Hot Dog Restaurant tournament in Times Square, NYC over the Thanksgiving weekend of 1980. Because Nathan's wanted publicity, they invited the press to report the results. This got Mike's picture on the front page of one of the New York City papers. The story got out on the news wires and showed up around the country. As a result, The Boston Globe did a big piece on Mike and the SCRABBLE® scene in Boston. He was interviewed by Linda Wertheimer on the NPR Network's news show, "All Things Considered" on Christmas Eve of 1980, in a segment about various game playing. Iowa Public Radio also had Mike interviewed on a program aired in and around Iowa. Mike was featured in an article on SCRABBLE® written by an editor of Yankee Magazine, who actually played in a tourney to be better prepared to write about the game. It is likely this was the Stamford, CT tourney of August, 1982, and the article was published a few months later in Yankee. It included a caricature picture of Mike by someone who never actually saw him; the likeness was inaccurate. Mike shows up in stories at least twice in the book "Word Freak" by Stefan Fatsis, but he is not mentioned by name there. Mike talked about SCRABBLE® as the guest on the Jordan Rich late-night radio talk show on Sunday, 28-Mar-04 fron 11 p.m. to midnight. This show broadcasts on WBZ AM 1030 in Boston, and it can be heard in several states. Unfortunately, Mike keeps so-so records of achievements, so there are several unknown facts, such as what's the highest scoring word he has ever played. However, Mike has kept track of his highest-scoring games. His highest score was 737 in a club game against Jamie Ryan, a strong player at the Lexington SCRABBLE® Club on 21-Jun-07. At that time, Jamie was ranked second in the club. In this game, Jamie traded seven in his first three turns due to terrible racks, and meanwhile Mike was drawing well and scoring high. By the seventh move, the score was 508-175. Mike had played a double-double and a triple-triple plus two other bingos. He later played a fifth bingo, but unfortunately missed the opportunity to play a second triple-triple. Had he seen one of the possible plays, he likely would have exceeded 800. Mike's runner-up game score of 709 at a Lexington SCRABBLE® Club game on the evening of 4-Nov-82. This record held for nearly 24 years when it was broken by the amazing 830-point win at the Lexington Club in mid-October, 2006. Mike's 709 game included his scoring 185 points for BUOYANCY on a triple-triple. He since has scored more than that for a single turn, which is detailed below. Mike's third highest game was at the Boston Club on 9-Jul-90, when he scored 701. The club statistician thought this was a 703, but Mike's records are clear about this. Even though he began that game with a "trade 7", he went on to play five bingos. He missed a playable sixth bingo in that game! All words Mike played were acceptable; this was not true in his 709-point game, but it was true in his 737-point game. This was, however, not a challenge-free game -- Mike was challenged four times. There is a list of all 700+ games achieved in North America at: http://www.cross-tables.com/club700.php, and Mike shows up on that list tied with the record of the most such wins - three times. Mike's 692-point game on 14-Jan-13 included 6 bingos played by Mike. Mike's 691-point game on 24-Jul-07 at the Sharon, MA Club included 6 bingos played by Mike, five of which were on successive moves. On 10-Dec-12 at the unofficial SCRABBLE® group which meets at the Chelmsford, MA Senior Center, Mike again played bingos on five successive moves. This game can be observed here. Mike's 687-point game on 16-Jul-12 at the Boston, MA Club included 4 bingos played by Mike, including the 149-point AGENTING. The other bingos were: DIaSPORE, OVERFAsT, and SEMIARID. All words played by Mike were acceptable, but he did not challenge the phony SPINEY. The losing score was 340, and so the total score was 1027. Mike's 680-point game on 16-Aug-10 at the Boston, MA Club included 4 bingos played by Mike. The most interesting one was on his opening play, where his rack was CHNPST?. He also made a 158-point MIDIRONS on a triple-triple. The other two bingos were OVERLATE and ANGELUS. Mike's 678-point game on 19-Aug-03 at the Sharon, MA Club was significant in that he played 6 bingos, but one was a phony. This game is somewhat described below in the Other Achievements section. Also, described there is Mike's subsequent 6-acceptable-bingo game. Mike's highest tournament game is probably his 673-228 game at Atlantic City, NJ on 25-Jan-04. Mike played 5 bingos in that game. He used one blank, did not have a triple-triple, and played no phoneys, but he was incorrectly challenged twice. Notice the spread of 445 points! This game can be observed here. Another high game by Mike was played on the first night of the new season of the Lexington SCRABBLE® Club on 2-Sep-99. Mike scored 668 with no phonies, including these five bingos: GOATEES (70 on opening play), INTIMAE (72), FLAVINES (167 points through the I in INTIMAE after opponent attempted a phony 149-point play in the same spot), AZURITES (86). He then hooked the L on the front of that word to score 44 for VIOLA. At the very end, Mike made a 4-point play with his R instead of finding the cute 14-point play by placing the R between A and DENT to make ARDENT. Mike's opponent had 400 less points. It took 38 years of competitive play for Mike to win a game with a negative score. On 16-May-18 at the Manchester, NH SCRABBLE® Club, Mike won a game with a game score of -7. He won by one point over Helena Gauthier, who scored -8. They made no plays; a game ends when there are six plays of zero score, and that is what happened before any words were placed onto the board. Helena began the game with a pass, and then Mike traded some tiles, since he could not bingo, and did not want to open the board; he assumed Helena might use one of Mike's played letters to make an 8-letter bingo. Helena then traded one tile. Mike traded again, and then Helena traded. This gave Mike the potential to end the game. Since he had all 1-point tiles, he took a chance that Helena did not have a blank, and he passed. She had six 1-point tiles and one 2-point tile. Each player subtracted the value of their own racks. Unfortunately, Mike keeps so-so records of achievements, so there are several unknown facts, such as what's the highest losing score he has achieved. The most likely one was against Seth Lipkin on 24-Jun-14 at the Worcester, MA Club. Seth defeated Mike 483-482. There is a problem with this achievement in that a few days later it was discovered there was an addition error made during the game which both players missed, and the error gave Mike 10 extra points. So, with correct scoring the next game mentioned here is really his highest loss. The "482" game can be viewed here. His 2nd highest (or technically highest) loss was in a game with Natalie Liebman on 24-Nov-03 at the Coral Gables (Miami, FL) Club. Natalie won 526-479. This game can be viewed here. At the time this was played, it became Mike's highest total game (1005), but that record was shattered only 6 days later at the Ft. Lauderdale, FL tournament in a tournament game against Wendell Haynes. Mike defeated Wendell 558-470, and so their total was 1028. This game can be viewed here. Mike has had higher totals since then. He lost with a 470 to Todd Dvoretz at the Ft. Lauderdale SCRABBLE® Club on Thursday, 11-Dec-03. That game also was the one in which Mike made his second-highest-scoring play, as covered in the next section. This game can be viewed here. He lost with a 464 to Richard Buck at the Boston SCRABBLE® Club on 19-Jan-98. On 21-Jun-07, Jamie Ryan lost with a 340 to Mike's 737, and therefore the total score was 1077. This game can be viewed here. On 27-Aug-09, Judy Cole lost with a 488 to Mike's 580, and therefore the total score was 1028. On 7-Aug-18, Mike lost to Chris Kulig 612-428, and therefore the total was 1040. This game can be viewed here. Mike's likely highest tieing score was when Jesse Day and Mike scored 446-446 on 22-Dec-11. Mike opened the game with /font>FOXED for 40 points. After Jesse's small response, Mike extended his word to the TWS making OUTFOXED for 57 points. On Jesse's next three plays he bingoed with DISARMED, UNTILLED, and SAPROPEL. Mike used blanks for his two bingos of VACUOlES and CRESTaL. The second-highest total score ever seen in the Lexington Club was achieved on 21-Jun-07 when Mike defeated Jamie Ryan 737-340; so their total was 1077 points. This game can be viewed here. On 12-Apr-13 in the first round of the Boston Area Tourney in Westford, MA., Mike defeated expert Bradley Whitmarsh 603-434, so their total was 1037. Mike played 5 bingos and had a 75-point non-bingo. This game can be viewed here. On 16-Jul-12, Mike won a game at the Boston Club 687-340, and so the total was 1027. On 21-Jan-10, Mike defeated Jamie Ryan 578-434 at the Lexington Club, and therefore the total was 1012. On 17-Aug-14, Mike defeated Steven Gonzales 521-488 at the Somerville Club, and therefore the total was 1009. Mike played 5 bingos in that game, and Steven played 2 bingos, one of which was for 140 points. Mike played an accepted phony which scored 42 points. This game can be viewed here. On 13-Dec-12, Mike defeated Diana Spiller 676-330 at the Lexington Club, and therefore the total was 1006. Mike played 5 bingos in that game, including an accepted phony which scored 167 points. On 30-Dec-10, Mike defeated Jamie Ryan 521-477 at the Lexington Club, and therefore the total was 998. On 29-Jan-09, Mike lost with a 440 to Jamie Ryan's 541 at the Lexington Club, and therefore the total was 991. Mike's highest score for a single play is 311 for his WhEEZIER on a triple-triple through the final E on 17-Feb-15 in the second game he played that night at the Worcester, MA SCRABBLE® Club. This game can be viewed here. With his game score of 655, it became the highest-scoring game in Worcester Club history at that time, beating the record holder by only two points. Mike's second-highest score for a single play is 239 for his natural OVERSIZE on a triple-triple through the I on 1-Aug-04 in the second game of the 2004 National SCRABBLE® Championship held in New Orleans, LA. Mike was playing in Division 2. This play was the highest in the entire tournament, where over 800 players were competing in 30 games over four days. This game can be viewed here. Mike's third-highest score for a single play is 212 for his natural EQUATION on a triple-triple through the T in a session of the Ft. Lauderdale SCRABBLE® Club on Thursday, 11-Nov-04. Mike went on to play 3 more bingos, one of which was phony (RERULING) and ended up with a 657. Mike again made a 212-point in Ft. Lauderdale. This was a one-day tourney on 13-Feb-10. He played a natural VAMPIEST through the E; the P was on a DLS. Mike's game score was 570. 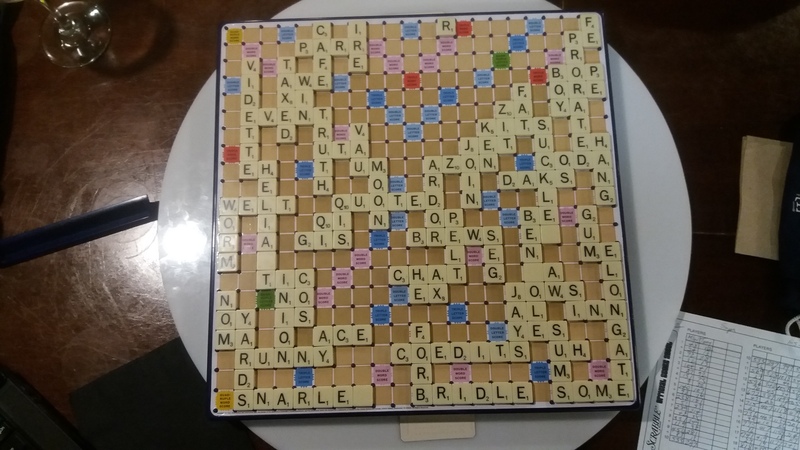 Once again, Mike made a 212-point play in the Worcester, MA SCRABBLE® Club on 26-Apr-16, where his highest play to date was made about 14 months earlier. He played WATERJET through the R. He played two other bingos in that game, and his game score was 641. This game can be viewed here. Mike's fourth-highest score for a single play is 194 for his natural SWERVING on a triple-triple through the W in a session of the Ft. Lauderdale SCRABBLE® Club on Thursday, 11-Dec-03. This was played at position O1, so the R and not the V was doubled. That game also was one where Mike achieved a high losing score of 470, probably his second-highest ever. This game can be viewed here. Mike also scored 194 points at the Lexington, MA SCRABBLE® Club on July 7, 2005 by playing OUTCHIdE through the I.
Mike again scored 194 at the Lexington, MA SCRABBLE® Club on May 27, 1010 by playing kVETCHING through the V.
On 20-Oct-03 at the Boston SCRABBLE® Club, Mike played what is likely his highest-scoring non-bingo. Although he held STANDER in his rack and could play that word in a couple of places, he instead elected to play the higher-scoring DRUNKEST through the U and K to make a triple-triple for 126 points. On 9-Nov-06 at the Lexington SCRABBLE® Club, Mike played what is likely his second highest non-bingo, which was ZAYIN, hooking to IN to make ZIN on a triple letter square; the score for this play was 106 and it became the second highest non-bingo played in that club at that time. Several higher non-bingos have been played in the club since then. 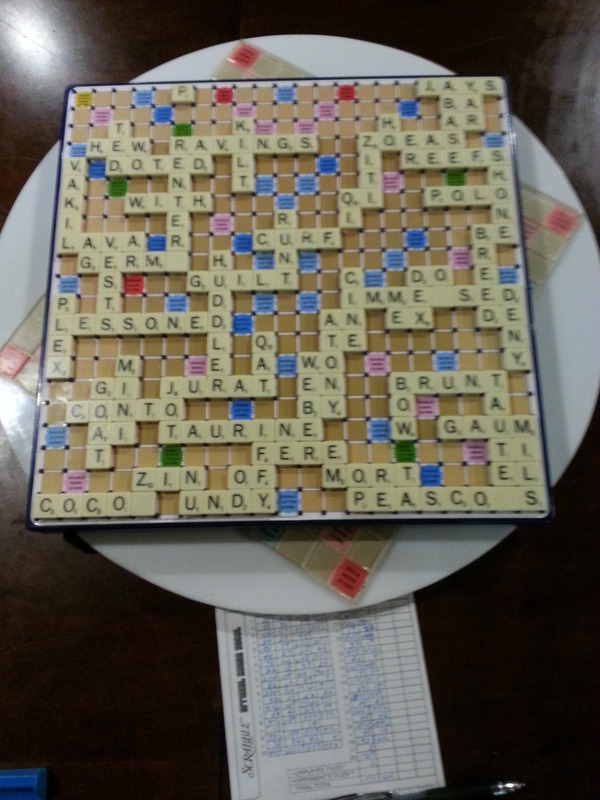 On 13-Jan-15 at the Worcester, MA SCRABBLE® Club, Mike made a 56-point bingo (which is the minimum possible) with the rack AEIOU?? to make ABOITEAU through the T which was at 11K. On 7-May-08 at the Manchester, NH Wednesday night club, Mike played a bingo and formed seven other words at the same time. With ALATION on the board and JUGA atop ALATION starting over the O, Mike placed NORITES directly under ALATION, also forming AN, LO, AR, TI, IT, JOE, and UNS. This is probably the first time Mike made such a play. On 11-Jul-18 at the Manchester, NH Wednesday night club (again), Mike made another 7-way overlap. After Mike played DEMETON vertically, Carol McDonald played BASTION, also vertically and one row to the right of DEMETON, with the ON in BASTION overlapping the DE in DEMETON, forming DO and ON. Mike then played OROIDES parallel to BASTION, forming BO, AR, SO, TI, ID, DOE, and ENS, and scoring 102 points! Just about 3 weeks later, on 22-May-08 at the Lexington, MA Club, Mike made a 6-letter overlap. PAGODA was on the board at position 3B, and the final letter of PAGODA was above an E. Mike played NOTaTES at position 2A just above PAGODA for 88 points, also forming OP, TO, aG, TO, ED, and SAE. On 2-Nov-13 at the Saturday afternoon club at the Kendall Library in Southwest Miami, FL, Mike made a 6-letter overlap. His opponent had just played a vertical bingo at B9 by hooking the starting letter to a tile at A9; that tile was a consonant which can be followed by an O to make a two and an OR to make a three. The word was ORATION. Mike then played PREsIDE at C8. Mike is unsure whether he has made more than these big overlaps during his many years of SCRABBLE® playing. Super Scrabble® is a board game based on SCRABBLE® with a larger board. The regular SCRABBLE® board is 15 x 15, and the super version is 21 x 21. The regular board is extended with 3 extra rows and columns on each edge, and in the added areas there are several premium squares which can help in making high-scoring plays. For example there are both quadruple letter and quadruple word squares, and there are some easy-to-use double-double places. There are places to make triple-triple plays with only seven-letter words. The bag of tiles with Super Scrabble® has 200 instead of the usual 100 tiles. The 200 tiles are not exactly twice the 100-tile distribution, but it is close. Mike has been playing informal open-book Super Scrabble® with players at the Chelmsford, MA Senior Center starting around the year 2013. He also often plays with the same aids at a restaurant/entertainment venue in that town. Sometimes more than two players participate in these games, but since individuals tend to get higher scores when only two players are competing in one game, Mike's highest Super Scrabble® games have been with one opponent. Mike's highest game score thus far was in a game on 13-May-16 in which he scored 1226; his opponent scored 604, so the total was 1830. The play-by-play .gcg file for this game can be found here. A photo of the board at the end of the game can be found here. In the previous game they played that same night, he won with 984-961, so their total was a record (at that time) high of 1945. He since had a total of one more. Mike's second-highest Super Scrabble® game was in a game on 18-Jul-14 in which he scored 1212; his opponent got 673, so the total was 1885. Mike played these six bingos: sOLERET, VERISMO, SCANNER, DIESELS, HOAgIES, DILATERS. He also made two high non-bingo plays using a Z: ZEST for 92 and ZEsT for 77; the are 2 Zs in the set. Mike again scored 1212 on 31-Aug-18; his opponent scored 722, and so their total was 1934. Mike players these bingos: VIBraTO, UNDERL(A)Y, REMATES, PReSSIN(G), TARRIES. The play-by-play .gcg file for this game can be found here. A photo of the board at the end of the game can be found here. Mike's fourth-highest Super Scrabble® game was played on 5-Jan-18 when he was the winner in a 1197-749 game, and so the record (at that time) total was 1946, and that is Mike's highest to date. The play-by-play .gcg file for this game can be found here. When looking at this game using WHAT, there is a bug affecting the shown total at the very end of the game. A photo of the board at the end of the game can be found here. Mike's bingos were: SUCKLEd for 98, COEDITS for 119, ELONGAT(E) for 83, PRORATE(D) for 76, VIDETTE for 88, HELIAsT for 91. Mike's fifth-highest Super Scrabble® game was played on 24-Apr-15 when he was the winner in a 1142-660 game, and so the total was 1802. Mike's bingos were: CATTLEYa for 63, rEFRONT for 80, TITULaR for 74, ACQUIRED for 124, and REOVIRUS for 116. He also made these non-bingo plays: PEAK for 62, DOOM for 47, JARINAS for 46, QAT for 45, NIX for 44, etc. This game is detailed here. Mike's highest total score achieved in Super Scrabble® was 2103, where he won 1107-996 against Emmanuel Aronie on 15-Jun-18. The game is detailed here. Mike's highest-scoring word in Super Scrabble® was made on 9-Jul-18 with SPlUR(G)ED with a blank L at 1A> for 194 points. The word was a quadruple-triple. Mike's second-highest-scoring word in Super Scrabble® was made on 30-Jul-18 with AL(M)ONERS at A1> for 182 points. The word was a quadruple-triple. In another game on that day, Mike made a quadruple-triple of ROOTlE(S)S with a blank L at A14 for 134 points. Mike's third-highest-scoring word in Super Scrabble® was made on 15-Jun-18 with CON(V)ENES at 1H for 167 points. The word was a triple-triple. The game is detailed here. Mike's fourth-highest-scoring word in Super Scrabble® was made on 30-Jan-17 with SCUR(R)iES at U14 for 158 points. The word was on a TWS and QWS, so it multiplied the base word, worth 9, by 12. In a subsequent game that day, an opponent scored 146 with another triple-quadruple word with S(T)iNTERS. On 3-Jul-15, Mike made a 152-point double-double non-bingo with ANTIS(E)X at 19J; it helped that the X landed on a quad letter square. There was a tempting opportunity to play SEXTAIN as a bingo elsewhere on the board, but that would have been for fewer points. His highest non-bingo on a regular (15 x 15) board was 126 points; this is described above in the section Highest Plays. On 4-Aug-14, Mike made a 144-point triple-triple non-bingo with JOINTED at 21H. This was immediately following his 110-point double-double bingo of PICRATES. 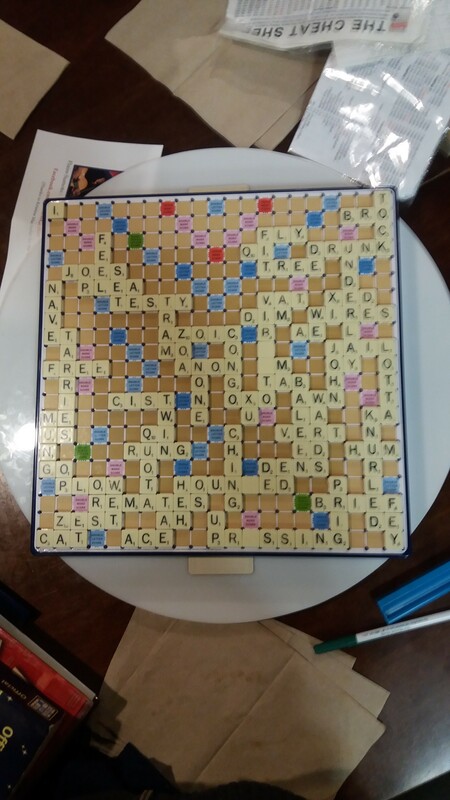 Mike made four consecutive bingos in a Super Scrabble® informal open-book three-person game played on 25-Mar-16 at a restaurant/entertainment venue in Chelmsford, MA. : RASTERS, TH(R)IVERS, LATRINE, and TUSKErS. On 17-Aug-11, when playing at the Manchester, NH Club against one of the top five players, having made the word QUARREL earlier in the game by adding to EL, Mike then extended this by adding four letters and forming the 11-letter QUARRELLInG. The score of the play was 40 points, since it was on a DWS. This is very likely the one longest word Mike has ever played. On the same evening as above, in a different game against the same opponent, Mike was losing, with the score at 393-194. He then was able to play VARICES for 103 and then continued to work his way out of the hole, including getting another bingo down, to a victory with a final score of 470-417. This is very likely the best comeback Mike has ever accomplished. On 24-Jul-07 when playing at the Sharon, MA club against an experienced novice player, Mike played 6 bingos in one game. All plays which remained on the board were acceptable. Mike played a bingo on his second move, and then starting on his ninth move, he made five consecutive plays which were bingos, one of which included a blank. The final score was 691-230. These are the bingos: UNOILED, OREGANO, TENSIoN, MATURATE, MORULAE, INTEGRAL. This game can be observed here. On 17-Nov-05, when playing at a Fort Lauderdale, FL club, Mike played 6 acceptable bingos in one game. The final score was 587-308. These are the bingos: TOMBOYS, SOUtANES, WAFErING, THIONATE, UNIQUER, TARDIEST. This game can be observed here. On 19-Aug-03 when playing at the Sharon, MA club against an experienced novice player, Mike played 6 bingos in one game. This achievement was marred by the final bingo's being an accepted phony. He played the 5 acceptable bingos in his first 8 turns. At that point the score was 469-76. The final score was 678-234. These are the bingos: REGALED, CATERAN, CENTRINg, NIMBLEST, DEsTAINS, ROUTINED. This game can be observed here. On 18-Dec-02 when playing at a Fort Lauderdale, FL club against an expert player, Mike played 5 bingos with no blanks. His opponent opened the game with a 2-blank bingo, and then through the course of the game Mike played THIONATE, OVERCURE, CREMATED, ACEQUIAS, and INFLATES. He scored 580. On 27-Apr-00, in a game at the Lexington SCRABBLE® Club, Mike played a game in which he made four consectutive plays which were bingos. He did this again on 16-May-02. On 30-Dec-10, Mike opened a game with a bingo on his first three plays, and although he found a bingo for his fourth turn, he declined to play it, guessing it was unacceptable. On 8-Sep-97, in a game at the Boston SCRABBLE® Club, Mike played a 9-letter bingo through two separated letters. The E and N were on the board, and he played RETAILING. This may have been his first or second such play since he started playing competitive SCRABBLE® in 1980. He did once or twice make a 9-letter bingo between two existing letters on the board, namely the first and ninth letters. One such instance was making COLLOIDAL when the C and final L were on the board already. Thanks to Jere Mead for remembering this. Mike played another split 9 with the natural SNOWBIRDS through the W and I in a game at the Lexington SCRABBLE® Club on 1-Jun-06. Mike played another split 9 with the natural LABORIOUS through the R and S in a game at the Atlantic City, NJ Tourney in January, 2009. Mike played another split 9 with the natural ENTRAINED through the N and first R in a game at the Lexington SCRABBLE® Club on 31-Jan-13. On 18-Dec-00, in a game at the Boston SCRABBLE® Club, Mike played 9-letter bingos on two consecutive turns: MUTINEERS from an MU and ROUGHNESS through an NE. On 26-Jan-16 at the Worcester, MA SCRABBLE® Club, at the end of his first game, when his opponent bingoed out, he held 25 points in his rack (with JKQIO), and so his opponent picked up 50 more points. In the 2005-2006 season of the Lexington SCRABBLE® Club, Mike had the most wins (190) of the season and the most total points (117,677 points). Dec-93 Enfield, CT - 1st interm. team, top 1st board interm. Of special note is Mike's going undefeated in Division 2 of the 15-game Main Event of the Boston Area Tourney in May, 2014. Before the NSA rating system began, Mike played in his first North American championship tournament when it was in Boston in July, 1985. He placed 60th in that event. Fifteen years later, Mike played in his second such tournament when it was in nearby Providence, RI in August, 2000; he played in 105-player Division 2 and finished in 8th place, winning 20 of 31 games. He also received a prize for the highest losing score in Division 2 for round 26; he lost by one point with a 426 to fellow Lexington, MA Club player Steven Saul. In this tourney Mike raised his rating from 1835 to 1842. Mike then played in his third North American Championship in August, 2002. This event was held in San Diego, CA. Seeded 16th, he placed 28th in 103-player Division 2. In this tourney Mike lowered his rating from 1769 to 1757. In his next North American Championship at New Orleans, LA in early August, 2004, Mike placed 19th in 138-player Division 2, which was exactly his seed position based on 1-Jun-04 ratings. After the first day of 8 games, Mike was undefeated and in first place, but he fell back on the second day, as his opponents became stronger. Mike made the highest scoring play of the entire tournament with a 239-point OVERSIZE. He received prizes for high word of the day, high score of the round, and high losing score of the round. In this tourney Mike raised his rating from 1732 to 1767. At the 2005 National Championship held in Reno, NV in late August, seeded in 23rd place in Division 2, Mike placed 62nd among the 110 players. He won 13 of the 28 games played in four days. At the 2007 Players Championship held in Dayton, OH in early August, seeded 3rd in Division 3, Mike placed 3rd among the 106 players. He won 22 of the 31 games played in 4 1/2 days. For most of the event, he was in first place, having won games 2 though 18. On the final day, when three games were played, Mike was playing for first place. After losing the first two games to the winner, that winner was clinched. Mike then played the third game for 2nd place. Losing that one also, he then placed third. His rating increased by 79 points to 1660. Mike's current NASPA rating is 1706, after playing in three events at Lake George, NY in October, 2018. At Woburn, he went from 1706 to 1718 after doing well in two early birds and below par in the main event. With that new rating, Mike was ranked 137th in North America and 13th in Massachusetts. He reached a very temporary peak with a rating of 1834 in April, 2011. Prior to 2011, he was rated above 1800 way back in November, 2003. Since the rating system began in the mid-1980's Mike's rating has bounced around, ranging from a low of 1481 in the Spring of 2007 to a high of 1970 in Spring, 1990. His highest ranking in North America was 24th in the Fall of 1997, when he had a brief (6-week) rating peak of 1955. The rating numbers no longer have the same meaning as they used to; there are now fewer players with ratings over 1900 than there were more than 20 years ago. Since rather early in its existence, Mike has kept the club statistics using a program he wrote. The rating system was designed by Alan Frank, with assistance from Mike, Steve Root, and a few others. It was used in the Boston Club also for a few seasons, but it has not been used there for several years. Mike publishes a weekly sheet which includes statistics of players who have attended within the past ten weeks. The sheet also includes some newsy bits, such as recent tournament results. It always mentions who scored the highest above average the previous week. There is a section of the news which presents words played or considered at the previous club session; this includes all challenged words. The list of words to ponder is first given, and then a list of only the acceptable words and their anagrams is presented. When it is convenient, Mike has been bringing his laptop computer to the club to assist as a word judge and also to make note of these words, making the publication of the word list in the next week's news very easy. He also provides access to an anagramming program as an aid in postmortems. In the absence of Mike's laptop, there is another one in use. There have been some periods in the club's history when Mike turned the duty of statistician to others, notably Steve Root and Joel Horn. Currently, Joel assists Mike when Mike is absent from the club. Since the Fall of 2007, Mike has also taken on the role as statistician of the Exeter, NH club to the extent that he uses the same rating system in use in Lexington, MA to produce weekly club reports. He is not involved with tracking club records in this club. In the Fall of 1997, Mike created the web pages for Massachusetts SCRABBLE® clubs, and he has served as the webmaster for these ever since. His web site also covers clubs in New Hampshire, Vermont, and Rhode Island. To make corrections or suggestions, please send e-mail to Mike. Since 1980, Mike has written programs to aid in preparing for competitive SCRABBLE® play. He announced and demonstrated a preliminary version of WHAT (for Wolfberg's Helpful Anagramming Tool) at NSC2004 in early August, 2004. Initial reaction has been excellent. It is being used regularly at the Lexington and Boston SCRABBLE® Clubs. Mike developed this program thoughout most of 2004 and for the first half of 2005, and he made improvements based on player reactions and suggestions. WHAT became available for sale in mid-June, 2005, and it became free in Janary, 2015. Mike wrote a CHALLENGE program to act as a word judge. This had often been used at the Lexington and Boston SCRABBLE® Clubs and had been used at some New England tournaments; the new WHAT program includes facilities for handling challenges. The NSA Technical Committee approved the use of WHAT (and its free demo form, called someWHAT) for adjudicating challenges in sanctioned tournaments. Mike has also written programs to list all the words in a Boggle® grid of size 4 x 4 or 5 x 5. WHAT includes solving for the larger grid. He has written a flashcarding program to help him learn 7- and 8-letter bingos. Again, WHAT includes support for flashcarding. Mike has created various word lists for others to use as study aids. Some of these are here on this web site. His one-page list of 2-letter words with meanings is handed to beginners when they first play at the clubs. back to the top of this page This page, maintained by Mike Wolfberg, was last updated on April 09, 2019 .